Ok so it's not a travel game as such. It is though most defiantly a traditional game with some travel elements that could do with some modern day exposure. It's a game that has been a long held tradition for many a child (and adult) during early autumn. Having been first played back in 1848 on the Isle of Wight in the UK. Clambering up trees or using big sticks to knock down the seeds to ready for battle. Perhaps soaked in vinegar to add that little extra help during the fierce clashes ahead? Conkers or Kingers as it's called in some parts of the world is a traditional game that is sadly disappearing. Perhaps caught up in the health and safety issues of our modern age? Too dangerous a game for the modern child? So with that in mind Sketches, a bit like it did with pooh sticks recently (link given) Pooh sticks. 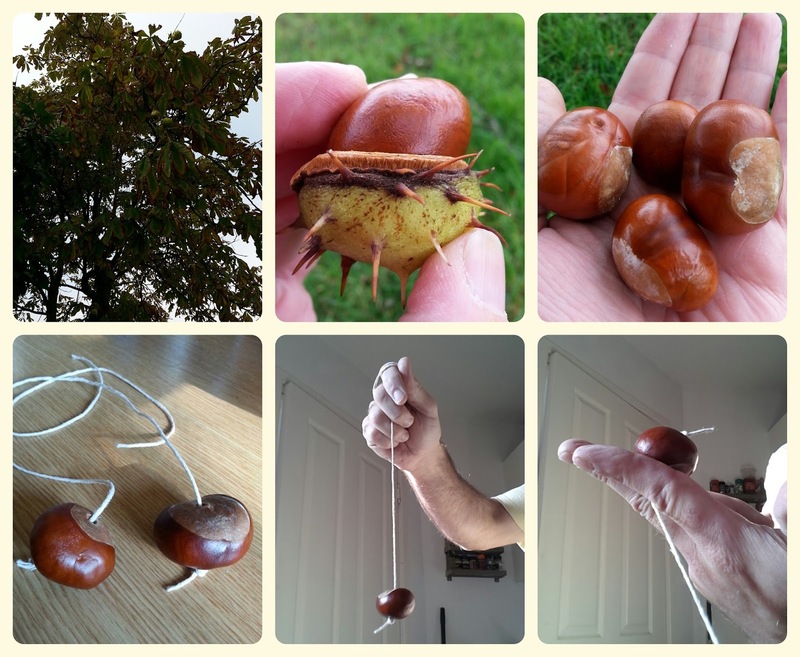 Wants to get you to go out, collect some conkers, do a bit of careful preparation and then play this wonderful old game. 1) Find yourself a Horse Chestnut tree (see above). 2) Pick your conkers, many are on the floor now. 4) Attach the string and get ready to play! The object of the game is simple. Destroy your opponents conker by hitting it. Taking turns to aim and then hit the other conker. If you miss first time, you get two further goes. Once you hit, then switch. If they get wrapped up together, the first to shout "strings" gets an extra go! If it falls to the ground, you can shout "stamps" and jump on it. If the opponent shouts "no stamps" before their opponent then it cannot be stamped on and the game continues. You win once the conker has been destroyed. If you are starting from scratch then you take the one point. If however you are playing another conker that has already won a few games, then you add the score of that conker to your own. So if yours is a 1 and theirs is a 6, yours becomes a seven-er! So there you are, a simple game in principle but one that takes a good aim, a little patience and an eye for a good conker! There is an element of family fun about this game too. What with collecting the conkers and then preparing them. And although I moaned about it with any game of this nature a certain amount of health and safety should be followed. However first and foremost fun should be had. So lets revive this wonderfully simple and seasonal game. There may even be a conker festival happening near you? Which is surely worth a visit? Will you go bonkers for conkers? When was the last time you played it? Do you have any tips for a better conker? I'd love to hear from you and please share this on the various social platforms. Spread the word and lets revive this traditional game.